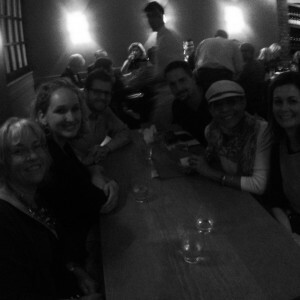 I recently had dinner with five strangers in New York City. No, really, I did. Well, sort of. You’ve probably figured out by now I don’t know a stranger, just friends I haven’t yet met. I’ll tell you more about these strangers I had dinner with soon in my Twelve Adventures series. But I wanted to tell you about dinner because it was AMAZING. There’s this mid-day TV show called The Chew. Have you seen it? I don’t watch it regularly. Really, I don’t! When I’ve tried to, I find myself yelling at the show’s healthy eating host or shaking my head in exasperation. But sometimes the TV gets left on around here for noise, hours after the morning news is over. Five days before my dinner with five strangers, the aforementioned healthy eating host on The Chew posed a question to the audience. “Should you buy gluten-free pasta?” Audience members had flip cards, yes/no. According to the healthy eating host, the right answer was NO. She went on to say you shouldn’t buy gluten-free pasta if you are trying to lose weight and that it could be filled with ingredients such as sugar or fat used in place of gluten. See, this is why I don’t watch this show. That’s a part truth. Some gluten-free products absolutely contain sugar or fat in place of gluten-full ingredients. I’ve not seen this with pasta. The one I eat most often contains brown rice flour and water. That’s it. No added fat or sugar. But other gluten-free processed foods, yes. It was a bad example. That was on Monday. On Wednesday, I found out where I would be going to dinner with strangers. 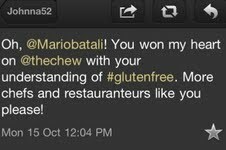 It was Otto, a Mario Batali restaurant in NYC. I called the restaurant, a pizza place, to find out what I could eat there. The phone call was the beginning of what I can only describe as a perfect gluten-free dining experience. If every restaurant handled gluten-free the way Otto did, I would never need to cook at home again. When I called, the gal on the other end of the phone asked for the name the reservation was under. I told her and within seconds she informed me that a note had been made on the reservation, as well as a message sent to the chef and pastry chef. She also let me know any pasta on the menu could be made with a gluten-free pasta and that my server would walk me through the menu. Sounds great, right? But I’ve heard that before, promises of safe dining and knowledgeable staff. There is rarely follow-through. Otto is an exception. 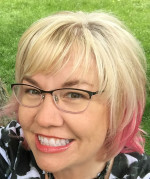 When our group of six was seated and the server came by to ask if we had any questions about the menu, I raised my hand to say, “I’ve got a…” and I didn’t finish my sentence before he said, “You must be the guest with the gluten allergy. I’ll walk you through the menu and make sure you have a great meal.” Whew. So y’all know it’s not an allergy I have. But I’m making peace with that word, allergy, since most people get it. He could use whatever word he wanted, allergy, disease, intolerance…I’ll roll with it as long as it would help me eat safely at a Mario Batali restaurant that was packed to the gills on a Saturday evening. I ordered a few bowls of olives for a starter. Another gal at the table ordered Brussels sprouts. When they were brought out, our server let me know he had confirmed with the chef all of the olives AND the Brussels sprouts were fine for me. I’m so glad, because the Brussels sprouts were amazing. Tossed in a cooked wine sauce, they were slightly sweet, yet had the acidity of vinegar, just enough to have a tangy bite. And the olives…well, I’ve never met an olive I didn’t like. 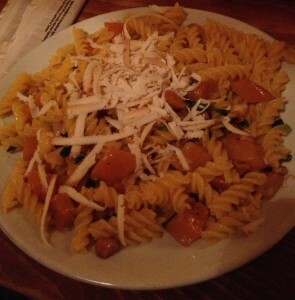 For my entree, I ordered a pasta dish, Penne con Noci Zucca. My dish was delivered separated from the gluten-full dishes and contained a corn-based pasta. The dish had a very light sauce, almost unnoticeable, and was topped with small cubes of butternut squash, halved hazelnuts and Ricotta Affumicata, a smoked cheese that Mario Batali suggests pairing with pumpkin. It works nicely with butternut squash, too. If I’m going to occasionally indulge in dairy, it needs to be good. This was better than good. Had I not been in the company of strangers unaccustomed to my food obsession, I may have licked the serving dish. It was that good. 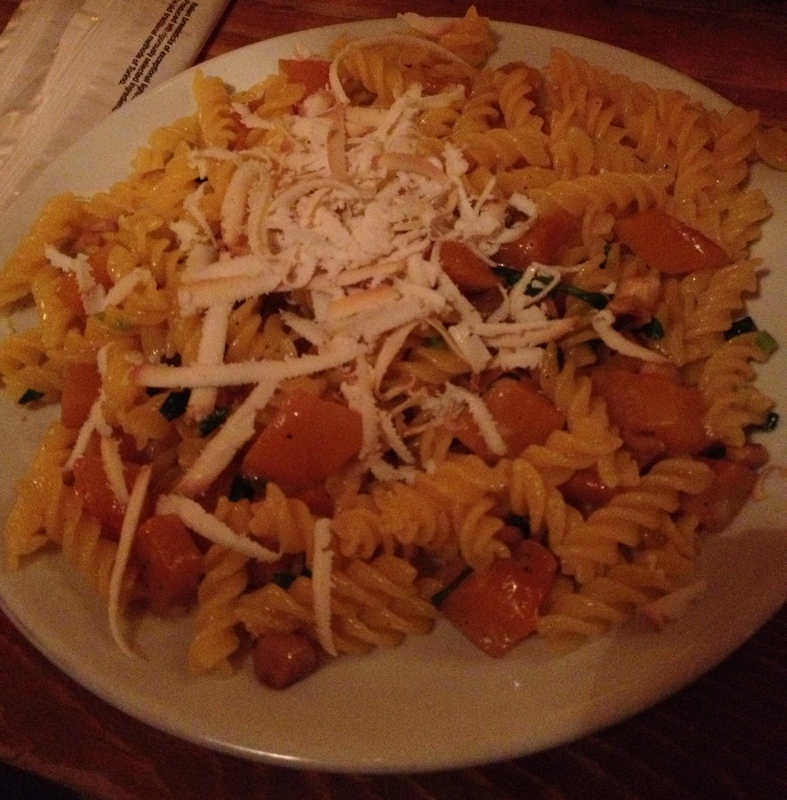 I rarely finish an entree in a restaurant, certainly not a pasta dish, but this one was devoured. The flavors of butternut squash, hazelnuts and smoked cheese work so nicely together. I sat at the table thinking about how I could re-create something similar at home, since I don’t find myself having dinner in New York City on Park Avenue most Saturday evenings. I’ll share what I came up with soon, a recipe of my own, that while very delicious, will never compare to the perfect combinations of flavors I enjoyed at Otto. While I did not have dessert, the server did say gluten-free dessert options were available. I kind of wish I had ordered a dessert, but am also glad I finished every last bite of the entree. Next time. Because I like to provide balanced commentary, here’s the only negative I could come up with. 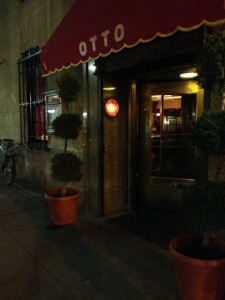 Otto is loud, bustling and seems to be a favorite place for large parties to dine together. It was a little tricky to have a conversation, hearing folks at the other end of the table was challenging. Near the hostess stand is a train station arrivals board, your table is ready when the destination given to you when you check in appears on the board with the number in your party. The noise level is similar to that of a busy train station. But something about that energy level is also very familial, the noise of a loud, happy family sharing a meal topped off with laughter. So don’t let the noise stop you from dining at Otto, just be aware that it’s not a quiet, intimate restaurant. Gluten-free friends, go to Otto. Give them a call so they know you are coming and arrive knowing you’ll enjoy your meal. This was by far one of the best experiences dining out gluten-free I’ve had. I hope to eat there again soon. It may not be with five strangers next time, but I’m sure it will be a fabulous meal safe for folks like me. 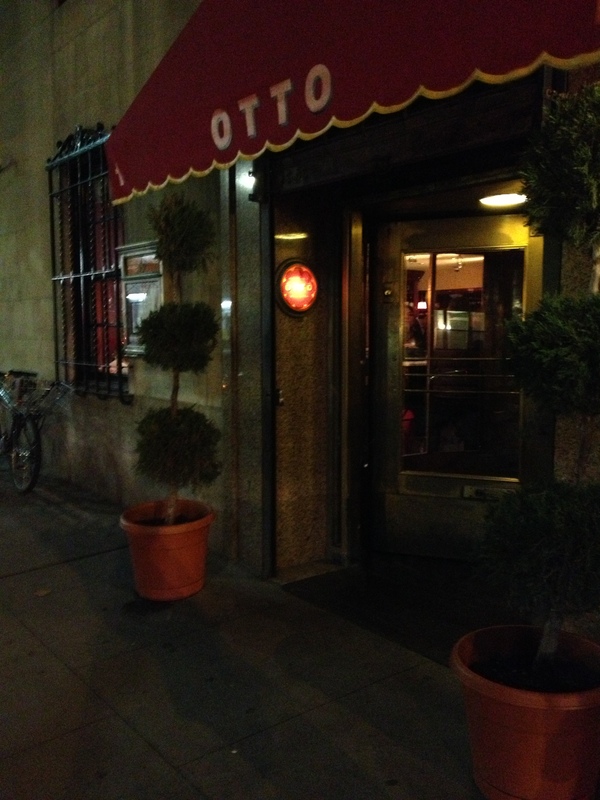 Otto is located at One 5th Avenue, New York City, 10003. Reservations may be made at 212.995.9559. Thanks, Debi. I did see your rant, a well-deserved rant. She makes me crazy yet I think she is put in a hard spot trying to share healthy food with co-hosts who wrinkle their noses at green smoothies. I’m sure it’s tough to find a balance of food that will appeal to their viewers. Ever since I listened to Heat (as I told you) and have seen Mario Batali on television, I’ve been intrigued by his restaurants. I’m so glad that you were able to check this one out for us all! Sounds like a scrumptious meal for sure. And I know what you mean about noise level. Sometimes hubby and I seek that kind of place out; other times I loathe such establishments (hubby is almost always fine with loud though). Thanks for the great review, Johnna! I’ve added that book to my reading list, Shirley! The world of restaurants and celebrity chefs fascinates me, but not so much that I would want to work in it. Can’t wait to see what you come up with for the recipe….it’s sounds fabulous!!! I just posted the recipe today. I hope you’ll give it a try, lovely combination of flavors!